Keep birds away from several spots in your backyard with these Esschert Design Hanging Scarecrow Owls. Placing these lifelike units in your trees or near your garden can safely and humanely deter birds, rabbits, and chipmunks from the area. Each realistic photo of a great horned owl, complete with an intense gaze and bright yellow eyes, will surely frighten rodents and small songbirds, as it is one of their natural predators. The flat, metal construction of each unit creates lightweight and versatile decoys, and a fabric cord at the top of each allows you to hang them from a hook easily. This also allows each scarecrow to move in the breeze, for added realism, and a bell at the base of each item rings for yet another deterrent. The detailed, realistic colors on these scarecrows resist fading, while the metal construction of each withstands exposure to the elements. Prevent birds from visiting specific areas around your home with these Hanging Scarecrow Owls. Note: This case pack includes 4 of the Esschert Design Hanging Scarecrow Owls. 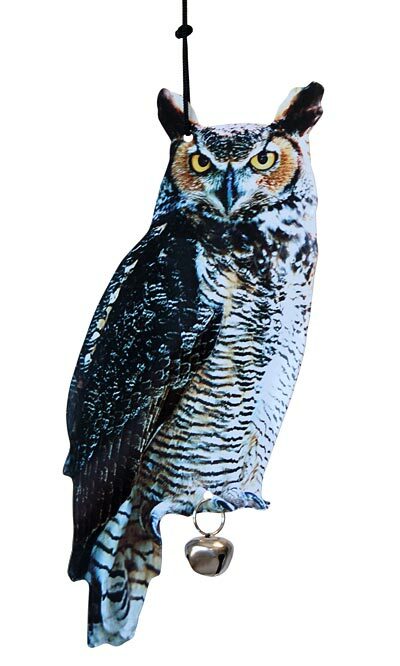 Esschert Design Hanging Scarecrow Owl, 15.25"